Banking « Global Market Insights, Inc. The latest cloud computing technology offers features such as finger vein, palm vein, hand geometry, voice, and facial recognition. Cloud-based biometric systems find applications in major corporations for extensive information storage, and are highly preferred owing to advanced features and cost-effectiveness. Growing demand for cloud services will escalate fingerprint access control systems industry growth. Fingerprint access control systems find applications in healthcare, consumer electronics, military & defense, government, banking & finance, and other commercial applications. The business sector will emerge as a major revenue generator, fueled by the demand for security systems in office buildings, schools, collages, and other areas. Fingerprint Access Control Systems Market for commercial applications contributed to more than 34% of the global share in 2015, and is set to witness tremendous growth over 2016-2023. Extensive demand for data security in popular electronic items such as tablets, personal computers, and smartphones will catalyze fingerprint access control systems industry growth, with manufacturers striving to integrate security features in electronic products. Banks and other financial organizations across the globe are incorporating high-end integrated technologies to mitigate security threats, avoid transaction frauds, and provide consumers with safe and secure account access. Adoption of biometric systems for personal identification and verification across the BFSI sector will be a major driving factor for Fingerprint Access Control Systems Market. Based on technological trends, fingerprint access control systems industry is segmented into optical, ultrasonic, capacitive, thermal, and pressure. Capacitive fingerprint access control systems are cost-effective and can be easily integrated into small devices, which results in their increased adoption across the healthcare and banking sectors. 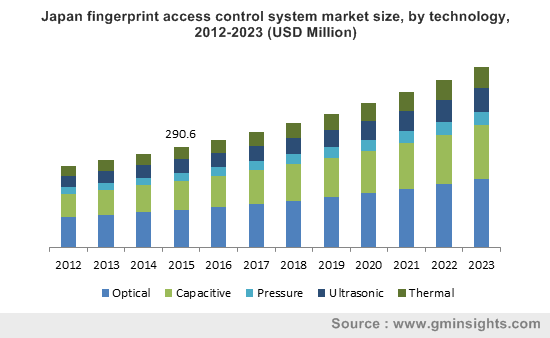 Capacitive Fingerprint Access Control Systems Market is projected to increase at a CAGR of almost 7.5% over the period of 2016-2023. Ultrasonic fingerprint access control system registers fingerprints via high sound frequency and is expected to exhibit significant growth over 2016-2023. Optical technology based fingerprint access control systems industry contributed to 35% of the global share in 2015 and is projected to exceed USD 1.75 billion by 2023. This growth can be attributed to the features provided by optical technology, such as high resolution, excellent image quality, low-cost maintenance, convenient integration, and high durability. 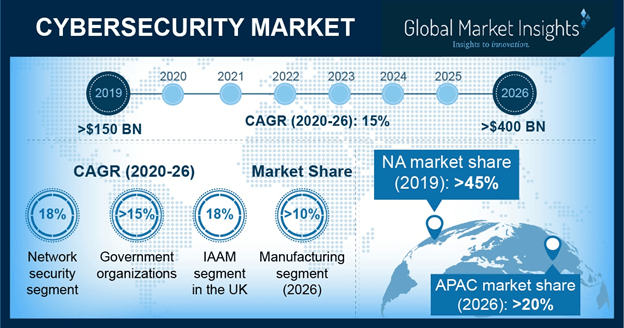 Asia Pacific Fingerprint Access Control Systems Market is predicted to grow at a CAGR of more than 7.5% over 2016-2023, driven by criminal activities, increased security concerns, and favorable government initiatives in countries such as India and China. U.S. houses industry giants such as NEC Corp. of America and 3M Cogent, which will drive regional demand. Increasing requirement of security systems across the healthcare and consumer electronics sectors will drive U.S. fingerprint access control systems industry. High crime rates in Brazil will contribute heavily to Fingerprint Access Control Systems Market share over 2016-2023. Furthermore, the unexplored sector of security systems and growing business landscape will drive regional demand. Key participants include Lockheed Martin Corporation, Aware, Inc., 3M Cogent, NEC Corporation of America, Cross Match Technologies Inc., and SecuGen Corporation. Other contributors include Safran Group, IDtech 360, Anviz Global, ZKTeco, Merkatum Corporation, Fingerprint Cards AB, Daon Inc., and Suprema Inc.
Mergers and acquisitions is the key strategy adopted by industry players to diversify their product range and deal with the rising industry competition. Increasing budgets across the BFSI, military, and healthcare sectors coupled with technological innovations provide numerous business opportunities to companies. This entry was posted in Sustainable & Smart Technologies and tagged Banking, Capacitive Fingerprint Access Control Systems Market, Finance, Fingerprint Access Control System Market, Fingerprint Access Control System Market Size, Fingerprint Access Control Systems Market, Fingerprint Access Control Systems Market Size, Fingerprint Biometrics Market Trends, Global Fingerprint Access Control Systems Market, Optical Fingerprint Access Control System Market, Pressure Fingerprint Access Control Systems Market, Thermal Fingerprint Access Control System Market, Ultrasonic Fingerprint Access Control Systems Market.